Our backyard garden area is in disarray. Dead banana leaves, tall weeds, empty cat litter buckets, and the garden hose are among the offensive truck in the garden. Someday, we will get around to cleaning up........ we have nothing but time here in Paradise. This beauty (the photo) has three companions and they are growing in the wrong part of the garden. It is called Cardosanto --- a.k.a. 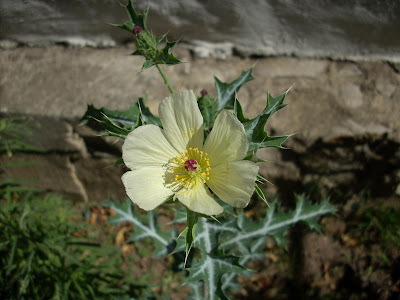 Mexican Poppy. Yes, I know it's a weed, but I do rather like the leaves and flowers. These puppies are starting to produce multiple blooms and, perhaps, I'll save the seed pods.